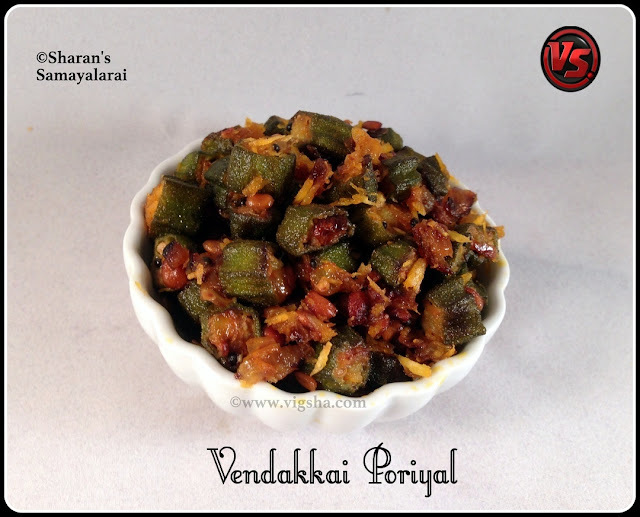 Vendakkai Poriyal is a simple and tasty recipe that goes well with South-Indian delicacies. Okra is also called as bhindi, vendakkai and ladysfinger. The main drawback of this Okra is its slimy nature, so they avoid cooking it. Click on this link to know How to avoid stickiness in Okra. Okra is one of the popular nutritious vegetable. It contain healthy amounts of vitamin A, and flavonoid anti-oxidants such as beta-carotene, xanthin and lutein. 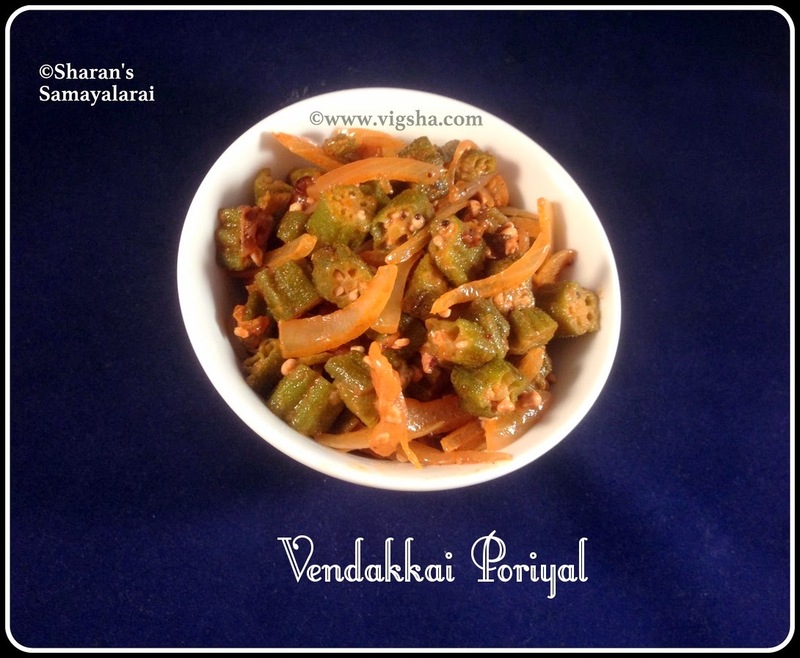 Check out Okra recipes which I have already posted :- Stuffed Okra ( Bhindi ) fry, Vendakkai Kuzhambu, Vendakkai Pulusu. 1). Wash, wipe* and cut lady's finger into 1" pieces. Heat a pan, stir-fry** the pieces without adding oil for 3-5 minutes. (or) Microwave it for 2 minutes. It helps to remove stickiness from the veggie. Remove and set aside. 2). Heat oil in a pan, splutter mustard, add urad dal and channa dal saute till turns light brown. Then add onions and fry till it turns translucent. Then add turmeric powder, salt and chilli powder and mix well. 3). Add the chopped okra and saute till it shrinks in volume. Sprinkle little water and cook it covered till it is slightly browned. Keep stirring throughout the process for even cooking. Finally add the grated coconut, give a quick stir and switch it off. Serve this delicious poriyal with sambar rice or curd rice. * Before chopping, wash and pat dry the okra's doubly well with clean cloth or paper towel. Make sure there is no moisture, otherwise it will become sticky and slimy while cooking. ** The purpose is to burn-off the sticky slime, but not to burn the Okra. If Okra turns slightly brown on edges its okay.